If you’re looking for a fun and unique way to illuminate your home, consider installing pendant lights. This has become a very popular lighting choice for homeowners due to their affordability and a plethora of stylish designs. These light fixtures are excellent to install in workspaces such as the kitchen or your home office. As a space-saving alternative to floor lamps and table lamps, pendants can provide your home with the perfect amount of ambient lighting. 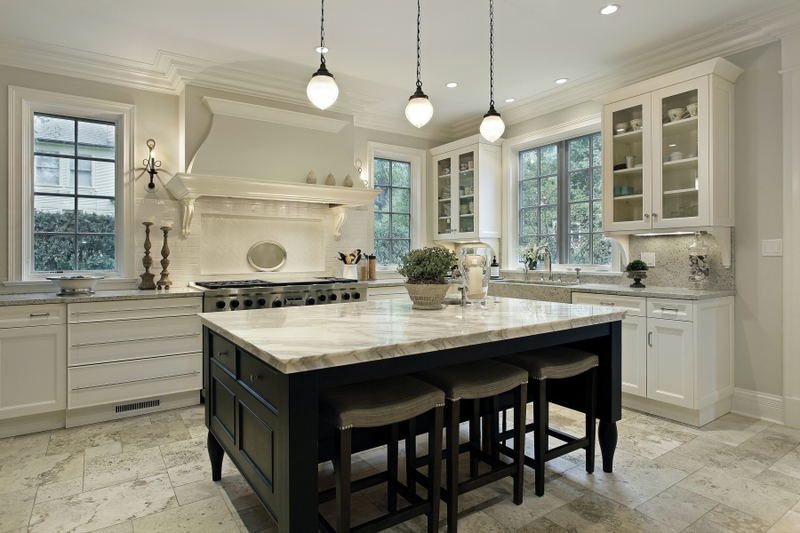 At M&M Lighting in Houston, we’re proud to offer some of the best pendant lights from trusted lighting manufacturers. We carry a large array of pendant lights from Kichler, Sea Gull, and Forecast, and our lighting experts are more than happy to help you find the best light fixtures for your home. When it comes to choosing pendant lights for your home or apartment, the style and shape of each fixture will depend on a variety of factors. From modern fixtures to traditional lights, you want to make sure the style of light you choose fits with each of your room’s decor. If you need assistance choosing the best pendant light for your kitchen, bedroom, or bathroom, contact the lighting specialists at M&M Lighting today. If you’re searching for pendant lights to install in your home, you’ll be happy to know there are a variety of styles and finishes to choose from. The most common materials used for this type of light fixture include glass, metal, plastic and cloth. A pendant light with clear glass will naturally diffuse light in all directions, which can make them a great option for your kitchen or bathroom. If you’re looking for a more industrial feel, consider installing pendant lights made of metals or other types of shiny finishes such as chrome or brushed nickel. 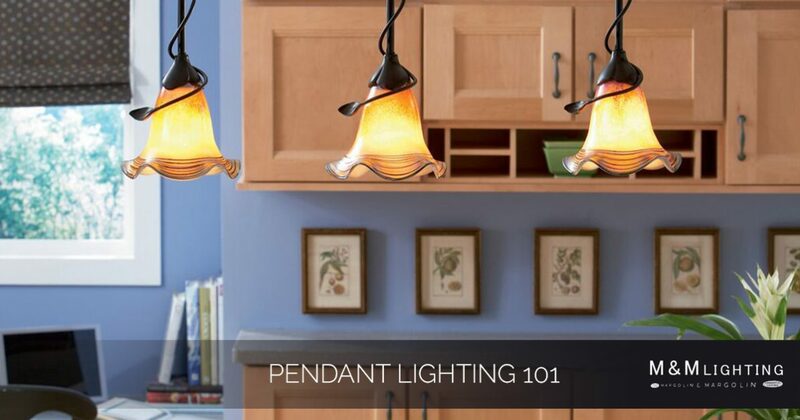 These types of pendants will also help reflect light, giving you enough illumination to chop vegetables in the kitchen. Looking for the perfect pendant light for your living room? Consider purchasing drum-shaped pendant lights made of cloth or plastic. One downside to cloth fixtures is that dust can easily collect on them, so you’ll want to make sure to dust it every now and then. While plastic can be a significantly less expensive option for homeowners, it’s important to note that these types of lights are prone to discoloration over the course of time. It may be wise to place these light fixtures in nooks or corners that are not exposed to much foot traffic to help them last longer. Depending on the size of the room you want to install pendant lighting in, there are many unique options to choose from. If your home features a lavishly large hallway or entryway, a large single pendant should suffice. On the other hand, small pendants like mini globes can be an excellent alternative to track lighting in your bathroom, bedroom or family room. With the large assortment of light fixtures available on the market today, it can be a challenge trying to decide what size pendant will work best in your home. If you need assistance choosing a lighting system for your bedroom, family room or office, contact the lighting professionals at M&M Lighting today! As a homeowner, you probably have an idea of where you need the most light in your home. Whether you work in a home office or you’re constantly preparing delicious meals for your family, it’s important to ensure each room of your home provides a sufficient amount of lighting for your tasks. If you’re looking for ways to add more light in your home without breaking the bank, consider investing in pendant lighting. For pendants that are inverted, light is streamed up towards the ceiling which can improve the mood lighting in your space. For pendants that have open bottoms, light is focused downward, creating great task lighting above a workspace such as the kitchen island. When it comes time to order new lightbulbs for your pendant lights, it’s important to have an understanding of the difference between LED lights and traditional lights. The lighting specialists at M&M Lighting are here to clear up any confusion you may have! According to EnergyStar.gov, compact fluorescent lights (CFLs) work differently than incandescent bulbs. Instead of running an electric current through a wire filament, these light bulbs drive an electric current through a tube with argon and mercury vapor. This creates an ultraviolet light that quickly translates into a visible light. These are different from incandescent bulbs because they don’t give off that warm glow. One of the main differences between compact fluorescent lights and incandescent bulbs is how much energy is needed to use them. CFLs use roughly 70-percent less energy than incandescent bulbs and can last for years to come. The average cost of of a CFL is roughly a dollar more than your average bulb, making them a wise investment for many homeowners. Choosing the best lighting system from your home can be a daunting task, especially without the help of a lighting professional. If you need assistance choosing the best pendant lighting or landscape lighting for your home, contact the experts at M&M Lighting today. We’re proud to carry high quality lighting solutions from some of the industry’s top manufacturers including Maxim, Uttermost, Forecast, and Sonneman.